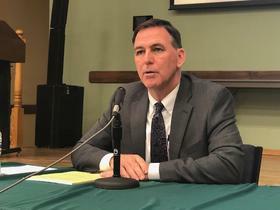 New Illinois Director Of Ag Says Knowledge Of Farming Industry Gives Him "Credibility"
John Sullivan was chosen by Gov. J.B. Pritzker to head the Illinois Department of Agriculture, succeeding former director Raymond Poe. Sullivan served as state senator of the 47th district from 2003 until 2016. During that time, he was the chairman of the Agriculture committee and championed legislation that was often praised by those in the agriculture industry. Sullivan operates a small livestock and grain farm in Rushville in Schuyler County and prior to his time in the senate, he managed his family-owned auction business. He said this first-hand knowledge of farming and the legislative process has successfully prepared him for this new role. "It gives you credibility," said Sullivan. "To understand agriculture is such an important part of being a director of this agency." Sullivan comes into this role at a unique time as the department continues to develop the industrial hemp program. The rules have been posted and are open for public comment, but there is still plenty of work to be done before farmers in Illinois can plant or harvest of the crop. "Right now there does seem to be a tremendous amount of enthusiasm for it," said Sullivan. "It can give us another commodity to sell and anytime we can diversify our portfolio we're going to reduce risk and it's going to give us other opportunities." Sullivan also cites industrial hemp as an opportunity for smaller farming operations to stay in business. After suffering years of declining crop prices, he believes it could be a good alternative. As for Sullivan's priorities, right now he said he simply wants to "get his hands around the agency." But long term, Sullivan said he aims to promote Illinois agriculture, try to help improve markets and promote rural development.